Originally published on 7/9/2012 by John K.
Sea-Buckthorn… this plant can do it all! These small berries are best harvested by hand. Best known for their thorns, silvery-green leaves, and their bright orange berries (oval and just under an inch long), Sea-Buckthorns have a lot more to offer… edible berries that are very high in vitamin C and antioxidants, drought-tolerant, nitrogen-fixing, tolerates maritime environments, can form a fruit-bearing windbreak or living fence, has almost no pests or diseases, and requires minimal maintenance. I have not eaten or grown this plant yet, but I plan to if I can while I am living within sight of the ocean. Originating in Asia and eastern Europe, there are 7-8 Sea-Buckthorn species/sub-species. The Common Sea-Buckthorn (Hippophae rhamnoides) is by far the most widespread and cultivated. The vast majority of these plants are cultivated in China, and they are used due to their soil and water conserving properties. Many of the improved varieties of Sea-Buckthorn were developed in Russia. Sea-Buckthorn has not become more popular on a larger scale due to the difficulty with large-scale harvesting. The fruit does not come off easily with any mechanical means (pickers squash the berries and shakers can harvest less than half the ripe fruit), so the only good way to harvest is slowly with our bare hands… the old-fashioned way. Perfect for the home grower! Sea-Buckthorn berries contain one of the highest levels of vitamin-C (15 times that of oranges!). A beer named Tyrnilambic Baie d’Argousier from Brussels uses Sea-Buckthorn berries. These small, tart berries are nutritional powerhouses. Flavoring component to Beer, Wine, Liquors, Cordials, etc. Nitrogen fixing plant (puts nitrogen back into the soil) – inoculated with actinorhizal bacteria (Frankia). Harvesting: Late Summer-Early Autumn. Pick when the berries are bright orange and just starting to soften. The fruit does not fall off the plant until it is past its prime. The thorns can make harvesting difficult (i.e.painful! ), so go slow. Some people will even clip berry-laden branch, stick it in the freezer for a few hours, and then easily shake the frozen berries off into a bucket. Storage: Fresh for a few days. Frozen for a few months. The dense, thorny, fast-growing hedge or windbreak can withstand salty winds. A single specimen in a garden – very pretty. Pollination: Dioecious (male and female plants); Need at least 1 male plant per 8-10 female plants for pollination. Appears to be pollinated primarily by wind. Years of Useful Life: No reliable information, but as this plant suckers so easily, this should not be an issue… as one plant starts to diminish, we can allow and nuture a new sucker. The thorns of Sea-Buckthorn are hard to spot with berries and leaves in place. The very small flowers are green and resemble leaves. Tolerates a maritime environment well. Tolerates frost (especially the flowers in Spring). Propagation: Usually from hardwood cuttings for true-to-type plants. Seed (needs 17 weeks of cold stratification). Minimal. However, since plants will fruit best on branches that are 2-years-old, regular pruning will increase yields, but it is not necessary. May need to prune back suckering roots to keep the plant under control… to keep it from forming a thicket. Sea-Buckthorn can spread fairly easily through seed or root suckering. 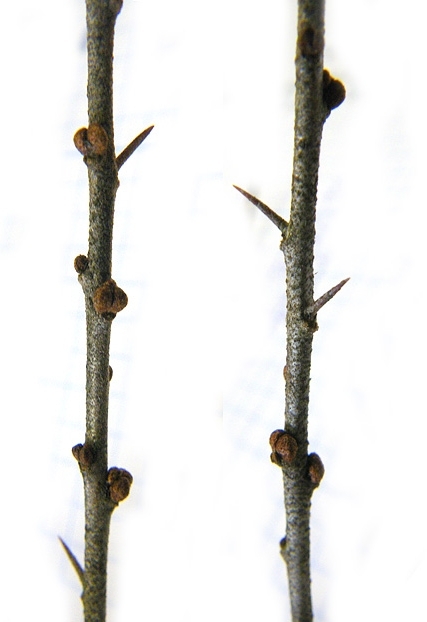 Thorns can make it a hassle to harvest. 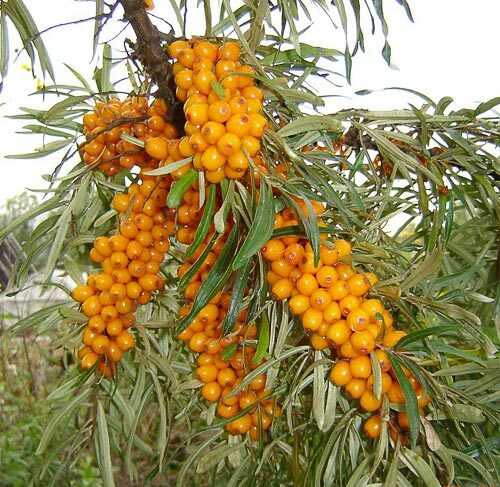 Widely known for juice, Sea-Buckthorn has many attributes making it worth growing.